Dazzy Vance, the face that launched this blog. My blog turns one-year old today. 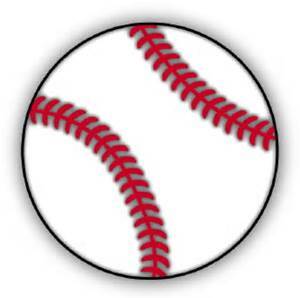 Over the last 365 days, I have posted 217 articles, mostly about baseball, occasionally about other topics. I’ve written stories on the modern game and on baseball in the years just after the Civil War’s end. 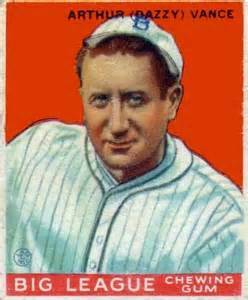 I’ve posted stories about, among many others, Will White, Fred Merkel, John McGraw, Babe Ruth, Satchel Paige, and, of course, Dazzy Vance himself, the one-time journeyman hurler turned Hall of Fame flamethrower. These men have all helped make baseball a great game and a fascinating conversation piece. Below, you’ll find stories I wrote in the early days of this blog. You may have missed them. Thank you for reading, and I look forward to another year of blogging about baseball. What should you expect from the Dazzy Vance Chronicles? As mentioned, most posts will be about baseball from an earlier era. By that, I mean a time before artificial turf, the designated hitter and summoning five pitchers to get the last five outs of a game. So many talented people write about today’s game; I want to do something different. (Just a little bit on my own baseball perspective: I am a long-time St. Louis resident, but I spent much of my impressionable youth in Southern California. That’s what made me a Dodger fan, and I remain one at heart. No, that isn’t always easy in Cardinal country. My favorite player growing up was Ron Cey, a hard-hitting third baseman for the Dodgers and, later, the Chicago Cubs. You also may remember him by his nickname, the Penguin. He not only hit, you see, he also waddled a bit. Back to the blog. You’ll notice that not all the posts will fall into a specific period, i.e., the Dead Ball Era, the 1930s, etc. I prefer to keep things a bit open-ended. Anyway, one fan’s old-timer is another fan’s childhood hero. You’ll also notice that some posts will be straight narratives, while others will focus on analysis, trivia or other tidbits. I hope you’ll notice, at least in time, a variety of styles and perspectives. I think that will make the blog more fun and interesting for both the writer and the reader. Every so often, I’ll write about the modern game, or I may write about a subject other than baseball. Consider those posts to be curveballs and change-ups. Every post is written by me unless otherwise noted. Thanks for reading. Play ball! Looking for the Dazzy Vance Chronicles? You found it! Thank you for stopping by. I hope you enjoy this introductory post and many more after that. 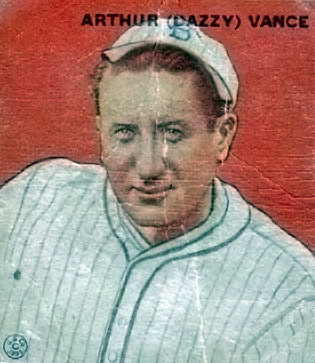 Dazzy Vance won 197 games in his career, mostly with the Dodgers. How did I settle on Dazzy Vance Chronicles as the blog’s title? Well, Charles Arthur Vance did have a pretty cool nickname, didn’t he? Beyond that, I wanted to name the blog after an old-time player. Will White just seemed too obscure. He pitched in an era not long after the Civil War had ended. The Lou Gehrig Chronicles would have been too easy. Gehrig was a superstar of the first order, like Ty Cobb and Babe Ruth. Better to go down one notch. Dazzy Vance seemed just right, a better choice than Walter “Rabbit” Maranville or George “High Pockets” Kelly. And, OK, I am a lifelong Dodger fan, so there was that, too.